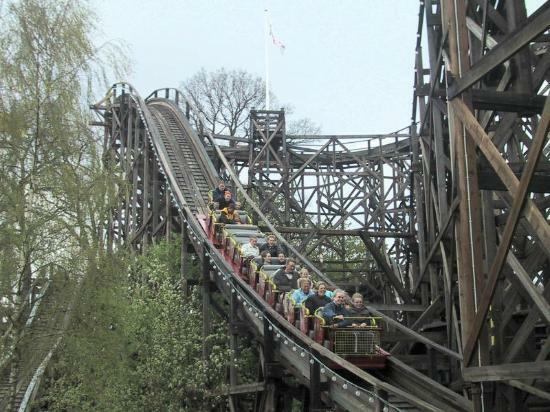 Dyrehavsbakken (“The Deer Park’s Hill”), commonly referred to as Bakken (“The Hill”), a ten minute drive north of Copenhagen, is the world’s oldest continuously-operating amusement park. Its origins trace back to 1583, when residents of Denmark’s capital would retreat to “The Hill” for its clean spring water. 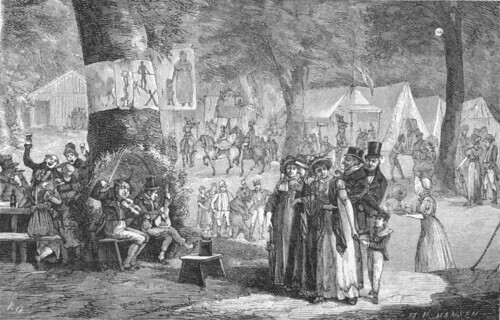 The large crowds attracted entertainers and hawkers, the forerunners of the attractions that make up the modern park. Today, Bakken is home to six roller coasters, the most famous of which is Rutschebanen (Danish for “The Roller Coaster”; pictured above, top), a wooden roller coaster open since 1932 (and a designated American Coaster Enthusiasts Coaster Classic), to dozens of other flat (or amusement) rides, and to gaming halls, restaurants, and shows. Visit Bakken.com, then Bakken… just be careful not to hop onto The Rollercoaster of Death by accident. 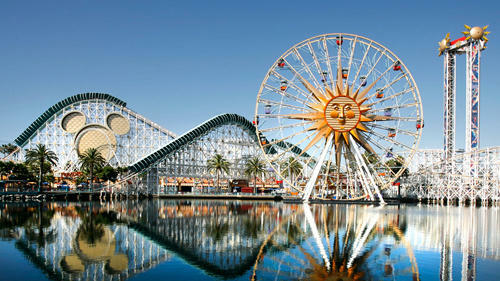 As we keep our arms within the car, we might recall that it was on this date in 1989 that 36 Disney executives gathered (for the next 3 days) to brainstorm ideas for a very different kind of amusement park– a second Anaheim-based theme park to be built next to Disneyland. The result was a plan for an attraction celebrating a place (and a state of mind) that hadn’t even been imagined when Bakken got going: Disney’s California Adventure.